I was off work on Thursday and Friday of last week. Due to my open schedule, I did a lot of baking. I tried out a few recipes that I found on Pinterest. This next one is to die for. I am in love! I may never make another cheesecake again because these mini ones are fabulous and so much less hassle! Cheesecake is another dessert that Brandon does not like (shame on him! ), so I have been munching all of these bad boys up! ENJOY! I found the recipe here. 1. Preheat oven to 350F. Line 8 cups of a muffin pan with paper liners. I found that I had more cheesecake, so I made 12. 2. In a medium bowl, make the graham cracker crust. Mix together graham cracker crumbs, brown sugar and salt and stir to combine. Pour over melted butter and stir with a fork to moisten the crumbs. 3. Place about a tablespoon of crumb mixture in each of the prepared muffin cups and pack down into an even layer. 4. In a large bowl, make the cheesecake. Cream together cream cheese, sour cream and sugar until smooth. Beat in the egg and vanilla extract. I am a cheesecake connoisseur, so I added more sugar to taste. It wasn’t sweet enough for me at first. 5. Place 1 tbsp chocolate chips into each of the muffin cups. 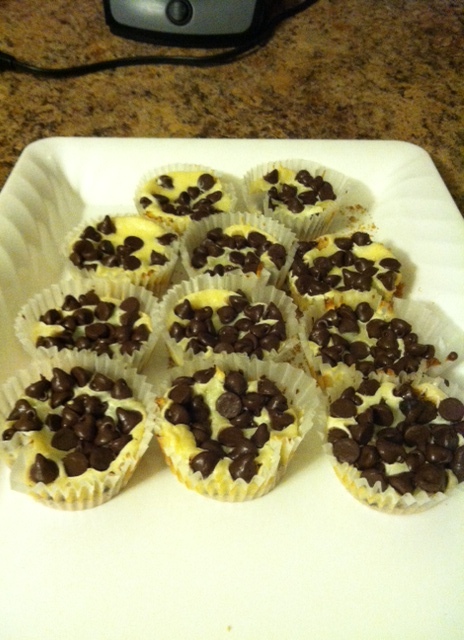 Evenly divide cheesecake batter between the muffin cups, covering the first layer of chocolate chips. Place another tbsp of chocolate chips on top of the cheesecake batter in each of the muffin cups. 6.Bake for 20-25 minutes, until cheesecakes are set. 7. Allow to cool for 10 minutes in the muffin pan, then carefully transfer cheesecakes to a cooling rack to cool completely before refrigerating. PS. This will not be the last cheesecake post you see. 🙂 I love cheesecake. Also thanks for subscribing to my blog, I hope you enjoy it!